I love zucchini. Last summer, I ate them and ate them every which way. Such as fritters. Love 'em. Made 'em every few days. Then, this year, I flat out refuse to buy any at the market. I don't know what it is, but this year, I need to take a break. Perhaps last year I overate my share?! Garlicky, oily zucchini with milky cheese and crusty bread? Sounds like heaven. Thank you! I love making zucchini pasta our of my julienne peeler and quickly blanching them. because of their sweetness, i like pairing them with a spicy tomatoes sauce! Great recipe! I'll incorporate into my lasagna! I've never really liked zucchini, but this does look delicious! As far as greatest hits go, I wouldn't say I say have one particular recipe but your recipe for peppermint bark comes out every christmas time and is always a big hit! Pan-frying sliced zucchini is the most common way to eat zucchini, or other types of squash (including pumpkin!) in my home country, Russia. I usually slice it a bit thinner than 1/4 inch and don't cook it for as long, just until both sides are browned, by which time the zucchini is cooked through and tender. I add salt and sometimes black pepper while frying, and like to sprinkle some chopped parsley and/or dill on top before serving. I might try garlic next time in addition to the herbs! Only you, only you, and only you can make zucchini sound romantic. I WILL DO THIS. Parents in law came and brought their glut of zukes, basil, and tomatoes. This post is very timely. Just my luck . . . this is the ONE year that I haven't been totally innundated with zucchini!! Looks like I'll have to buy some and try this recipe . . . sounds like a terrific way to cook them. By the way, June continues to enchant! Now I know what to do with all the zucchinis my mother brought me home from her garden. Thanks! The zucchini sounds divine, and I welcome more ways to use up the single plant that produces so abundantly. I wish my tomatoes would offer the same bounty. I've been making a variation of Joy the Baker's corn and tomato tacos, pretty much all summer long. They're delicious, even though I cheat and use pre-mixed taco seasoning. Also, the kids just LOVE them with smashed avocado or sour cream on top. I've barely done any cooking the last couple months since I was rarely home (work, school, other school, repeat). But when I did, it seemed to be zucchini butter (food 52), sauteed zucchini with aleppo pepper and mint, and an ungodly amount of avocado and egg sandwich combinations. Oh, and batches and batches of homemade hummus. The one thing I took time to make this year was focaccia. I use Nancy Silverton's method (basically, lots of oil in a cake pan) with whatever dough I have in the kitchen. Sometimes hers, most of the time not. I am thrilled to see this recipe, in part because we keep having our squash / zucchini spoil in the fridge before we can use them. When they come in the farm box next week, I will avoid putting them in the fridge at all and instead cook them up this way. Zucchini is a faithful friend in our home, well loved in any form! I often stuff them with a mixture of their steamed pulp, parmesan, herbs and bread crumbs. But just sauteing them in olive oil with a clove or two of garlic (and maybe finished with a spoonful of sour cream)works every time too! Add a bit of lemon zest, and/or the juice of the lemon and you have one of my standard recipes. I make a zucchini pie (okay -quiche, if you must!) that has onions, garlic, basil and oregano, fresh parsley, salt and pepper, eggs and mozzarella cheese. But what puts it over the top is a good slathering of Dijon mustard over the crust before the filling is put in. You might try yours with a little Dijon added – see what you think! It is also beautiful in it's simplicity and the mint makes it! I can get these amazing little sieglinde potatoes at the farmers markets in Vancouver, I highly recommend them if you can get them. The zucchini sounds delicious. Happy belated birthday to you and June. My mother used to make a dish called zucchini fans. It's a lovely thing to make, especially with tiny zucchini, and especially if you add smoked paprika to the crunchy topping. For the record, though, I think zucchini is wildly under-appreciated. Thanks for the post. I wonder if this would work with little pattypan squashes, too? I just got some from the farmer's market but I'm not sure what to do with them. I've made zucchini pie 3 times this summer already. It's a great recipe and so easy– like a zucchini and provolone frittata but thick and fluffy. Love the idea of your recipe with some mozzarella di bufala and fresh basil! I love the idea of “greatest hits” for the recipes I make over and over. Probably the one constant is a riff on an amazing penne with sausage and rapini I ate at Cafe Zoetrope in San Francisco years ago. My boys weren't big rapini fans but they love regular broccoli so I make it with lots of that and toss in a handful of rapini when I can get it and arugula when I can't. The boys are “out of the nest” now but request it every time they come home for a visit and my youngest one asked me to teach him how to make it now that he is living off campus at college. Yum! I've been making something similar and tossing it into a carbonara style pasta (sans bacon), its delicious! love love love zucchini! will be trying this soon! I just picked up some zucchini from the farmer's market today. Looking forward to trying this! Zucchini is amazing. I love it fried with almonds. I've always thought that your recipes for vegetables are the best there are, thank you. As this recipe demonstrates, simple is often best and that is why these kinds of recipes always make the greatest hits list. I read about this recipe on Rachel's blog earlier this summer and a few hours later I found myself browning garlic in a lot of olive oil, a technique I've been using a lot ever since. But after reading this, I need to make sure that I have more milky cheese and crusty bread on hand at all times! Mark Bittman's “Slow Cooked Green Beans.” I have eaten them at least once a week. And your story is so similar to mine, in that I too was once a devout al dente gal. But through the magic of olive oil, slow cooking, and Bittman's recipe – I was happily converted. 1. Combine all ingredients in a large saucepan and bring to boil. Cover tightly and cook over medium-low heat for 1 hour, checking every 15 minutes and adding water by tablespoons if necessary. Longer cooking, up to 1 hour longer, will not hurt a bit. You won't believe it, but I had these for dinner today. And it never even occurred to me to try this same technique with zucchini. I can't wait! Thanks! I always have great aspirations for all of the things I am going to make during summer when I don't have to worry about school and everything else. But sometimes it is nice to actually take the down-time to relax and keep things simple! hi – love your blog and eagerly await your posts (wish they were more frequent, but understand demands on your life). I have Jerusalem and your post on the pasta with peas, feta and chili oil pine nuts inspired me to make it. awesome! Read the post about the lamb soup – doesn't look like much, but you know what? I'm going to make it because you are mostly right on the money! Do you really want my “best hits”? – cause I'll send them! Made this tonight and it is simply amazing. The zucchini lent its real flavors after being cooked for a loooong time. We paired it with mozzarella but since we were out of crusty bread, we had it with margarita “naan pizza” instead and it was lovely. Thank you for the recipe share! P.S. What I have made several times over the past few summers are your oven roasted tomatoes (from your book). Just made a batch today and they are great as always. I had that exact cocktail just the other night at Essex, or, rather, I bullied my dad into trading with me because I liked it so much. Totally brilliant. This sounds great! I haven't had zucchini all summer. My mom told me about a chocolate cake she made recently that secretly contained shards of the grated green stuff. my mom, not once, but twice, bought cucumbers thinking they were zucchini and we were left eating slices of cucumbers with hummus instead of gently sauteed zucchini. (I, not once, but twice, just misspelled zucchini while writing that last sentence (zuchinni)). I adore all of Rachel's recipes so I most certainly will have to try this one. Have you tried her tiramisu? so.freaking.good. And did you see she has a cookbook coming out? She just posted about it, exciting times! – it's ALL about the crust! That's so funny. I made zucchini exactly like this just last night. Except instead of garlic, I perfumed the olive oil with some vadouvan. At the end I added some freshly squeezed lemon juice and the result was phenomenal. Made the zucchini recipe last night, topped it with crumbled feta cheese instead of mozzarella; it was great, and went very well with the grilled pork tenderloin I made! My go-to summer recipe is Mediterranean burgers: combine ground beef and turkey, add into the meat dried or fresh Italian herbs (rosemary, oregano, etc. ), minced garlic & red onion, minced sun-dried tomatoes (in oil), and crumbled feta; form & grill the burgers, serve on onion buns. Delish! This sounds divine! Must happen this week. Thanks for the lovely story as usual. I love making zucchini pasta our of my julienne peeler and quickly blanching them. Molly, thanks for your sharing. Lovely! And zucchini are just starting appearing at the markets here. I got bored with them, and end up eating zucchini julienned, raw, marinated in olive oil and lemon juice, but I am going to try them slow cooked for a change. Thanks! Rachel's blog is one of my favourite – she is so good at capturing the essence of Italian cooking and describing the hazards of Roman life, my newly adopted city. These slow-cooked zucchini are a staple when we have lunch with my boyfriend's Italian family (although he makes do without the basil and he uses a mix of olive oil and rapeseed oil). And yes, my favourite way of eating them is to spoon some (a lot really) on my plate next to a milky mozzarella, mopping up the mixed juices with a piece of sourdough bread. As for my go-to recipes? Pasta with homemade beetroot and walnut pesto and chickpea and fennel 'risotto'. can i make a personal plea (which i may have already done) for you to never change your header photos? Seems like a fairly easy recipe. I still could see myself burning down the kitchen but, still an awesome post. I've been eating zucchini and yellow summer squash this way my whole life. My mother learned it from her mother in -law, and she from her mother who came here from Italy. And back, and back and back. We always had it pretty brown and caramelized. I'm not sure if that was originally how it was supposed to be, my mom likes to read and she may have gotten distracted and let it cook a little too long. No matter, that's how I make it now. Maybe my son will make it someday too. I hope so. Part of his heritage. Part of mine. I actually tend not to cook a lot of same over and over again (perhaps because there's too much pressure to have new stuff to share on the site) but I will make Kim Boyce's chocolate cookies (and a million variations of it) over and over again. They never lose their magic 🙂 Also, I'm a one-trick pony when it comes to ice cream- I swear by Jeni's Splendid Ice Cream cookbook, and her method. I'm not a huge zucchini lover, preferring winter squash over summer squash. That being said, your version with the cheese & crusty bread sounds pretty tasty! sounds absolutely divine. oh, this blog is too lovely. I love that you embrace repetition. A good friend of mine embraces this in the context of conversation and storytelling. We all find ourselves telling the same story several times, in slightly different ways from time to time. Sometimes it gives you just the right way to work through thoughts and feelings. Just want to say thanks for your excellent blog and all the lovely recipes. I've tried many and will give the zucchini a go. I also have several “go to” recipes I make over and over. Someone else mentioned Kim Boyce; I always make her Figgy Buckwheat Scones for company. Sometimes I make the Fig Butter (the recipe makes lots of extra and it is so yummy) or sometimes I just use Trader Joe's Fig Butter when being lazy. Zucchinis (or courgettes as we call then here in the UK)don't usually excite me, but this recipe sounds divine. I recently saw a Jamie Oliver recipe for minted courgettes (to be served with feta cheese stuffed pork fillet) and thought that was great way to liven it up. My go-to recipe is peanut-citrus chicken with cashew nut noodles and baby gem lettuce. It never fails me. Being Venetian, zucchini this way are by far the most familiar way of cooking them – and I loved to read Rachel's take on them, her voice just makes everything special. I shall try this, sounds delicious. I recently made up what I decided was a “late summer green soup” starting the pan off with some diced pancetta fried with a clove or two of crushed garlic, then adding sliced zucchini, chopped leeks and fresh peas, then topping up with chicken stock and seasoning. Cooked in a very few minutes and was delicious with some crusty bread. I'm sure there are numerous variations within this recipe. This was just what I had available in my vegbox but good enough to make again! I've made this dish twice in the last two weeks, and it's just fabulous! I used a soft goat cheese instead, and it works beautifully! My husband said that this was the best zucchini he'd ever had! Thanks, Molly! I'm incredibly late to the party but when my garden gives me an excess of zucchini (and in reality, when does it not?) one of the things I do is cook it like a potato until it's tender, slice it in half, scoop out most of the center (leave about 1/4 inch) and then? In a pan with some olive oil or butter, take the zuch insides and saute it with diced tomatoes, sliced mushrooms, onions and some garlic, when everything is “soft” toss it with the breadcrumbs of your choice, salt, pepper (or whatever you like) some freshly grated parm and refill those zuch shells. Top with buttered breadcrumbs and a touch of your choice of cheese and bake until the cheese is melty and the “crumbs” are golden. One of the many ways a southerner gets “rid” of their zucchini! PS: Love your site, a (very) long time lurker. Those meatballs! That sauce! I am very pregnant and that dish hit all the spots. THANK YOU. you asked about our greatest hits and I must say that your (brandon's) recipe for chana masala has been in constant rotation for years now. I am currently traveling the country in my car (with a small box of spices and kitchen items) and staying with friends or friends of friends or sometimes new friends and when in doubt I know I can feed/impress any crowd with your trusty standard. this in addition to an exceptional Kale salad and an ever changing chickpea tuna salad I can make with whatever is fresh and on hand and practically with my eyes closed. I must also thank you for so many years of delicious and inspiring writing, beautiful photographs and sharing. I have been a fan for a very long time. a million thank yous from me and all my happily fed friends. I love zucchini and this recipe sounds wonderful. 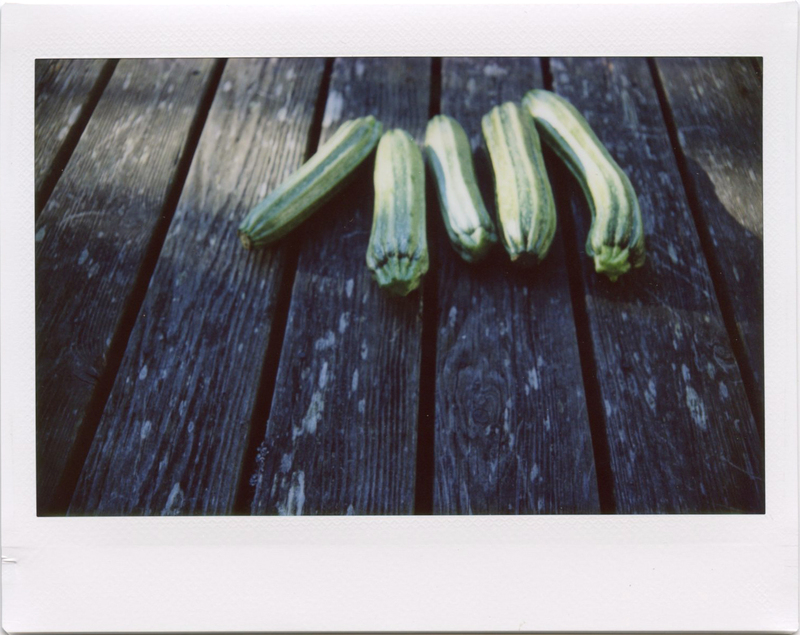 I am missing summer and endless supplies of zucchini.